Have you ever experienced a loss that seemed like a disaster, yet, in time, proved to be a blessing? To Jesus’ friends and followers, his death and burial in a cave were the absolute opposite of what they had fondly expected. In those moments, it seemed that everything that he had promised had been a giant hoax. Their hopes were dashed. Through the gifts of hindsight and our faith, we know differently, and in this month of April, we reflect on the events of the first Holy Week, through a different lens from theirs. 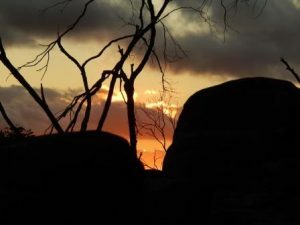 Unlike those who stood by, shocked and disheartened as they witnessed Jesus’ burial in a borrowed tomb, we know, and will celebrate again at Easter, that he rose again ‘on the third day’, and that his memory lives on in the lives of his present-day followers. 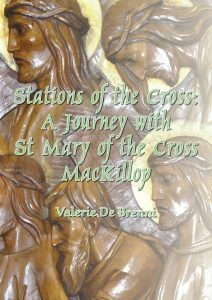 After a lifetime committed to following Jesus, and ever-mindful of the Cross in her life, Mary MacKillop’s burial bore a striking resemblance to that of Jesus. Her tombstone was also provided by a friend, Joanna Barr-Smith. Mary, of course, did not physically rise from the tomb, but her memory too lives on today. Mary’s spirit has captured the hearts of countless people who continue to be inspired by her story of love, courage, compassion, forgiveness and trust in our God who never stopped providing for her. This month, we are invited to spend some time reflecting on the scene of Jesus’ burial, and to stand in solidarity with those who have lost hope. 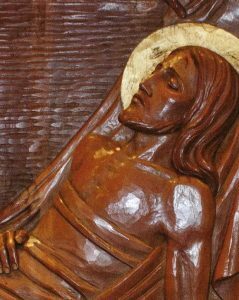 Gently, Joseph of Arimathea wrapped the body of Jesus in a linen cloth and placed in on a ledge, in a tomb that was probably a burial cave cut from the soft limestone rock. To protect the body from wild animals a large rock is placed at the entrance of the tomb. Those who love Jesus mourn their loss: it seems that all is lost. The vision of God’s reign, so central to the life and ministry of Jesus, seems now a distant dream. Mary MacKillop died in Alma Cottage, North Sydney on 8 August, 1909. 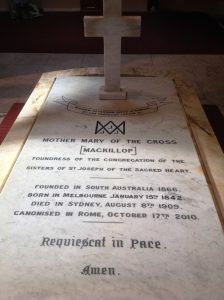 Initially she was laid to rest in the Gore Hill Cemetery but in 1914 her remains were transferred to the Mary MacKillop Memorial Chapel at Mount St, North Sydney convent where she was placed in front of the altar of the Blessed Virgin. Joanna Barr Smith paid for the beautiful marble tomb that has become her final resting place. This has become a place of pilgrimage as thousands of pilgrims come each year to visit this sacred place. If you knew that this was your last day how would you spend your time? What would you want to say to the significant people in your life? Take a moment to reflect in silence upon these aspects of your life. We tend to take life for granted and live in an unreflective manner. The death of a loved one can pull us up short and help us to re-prioritize what is really important. We come to a deeper understanding of what gives life meaning. Jesus you call me to be open to every aspect of my life, to be aware of its beauty, its gift. You invite me to live with intention, to embrace each day. Constantly draw me toward all that is good, so that through my actions others may experience a glimpse of your goodness. Forgive me Lord for the times when apathy in given free reign and I become blind to all that life holds. Encourage me to ponder on life’s meaning. Help me to graciously accept the process of ageing and to find wisdom in the passing of time. May I finally delight in your presence and find my rest in you. ‘Jesus is buried’: Mary Ryan rsj. Used with permission.